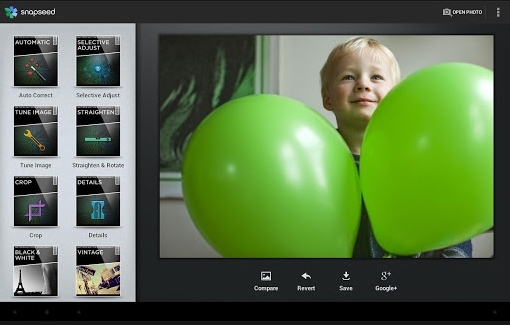 Google launched the best photo app Snapseed for Android mobile phones and tabs. With Snapseed user can makes any photograph extraordinary with a fun, high-quality photo experience right at fingertips. And user can easily adjust his/her photos with a single tap using Auto Correct. With Snapseed User able to edit photos and share it on Google+, Facebook, Twitter and other social networks. With this app you can tune, straighten and crop photos and Experiment with fun and innovative filters like Dammam Vintage, Grunge, and Tilt-Shift. Add image Boarder for a finishing touch. The App runs on Android 4.0 (Ice Cream Sandwich) or later operating system enabled Phone or Tablets. Supported input format are JPEG and TIFF image files. Languages available in App are English, German, French, Spanish, Brazilian Portuguese, Japanese, Chinese, and Arabic. Auto Correct - Automatically analyses your photo and adjusts colour and exposure to perfection. Selective Adjust - Make precise selections and enhancements to specific areas of your photos in seconds with Nick Software’s revolutionary U Point technology. Tune Image - Use Ambience to create depth and vibrancy that uniquely adapts to colours and textures. Adjust White Balance, Saturation, Contrast, more. Straighten & Rotate - Rotate 90° and/or straighten photos with simple gesture controls. Crop - Easily crop images to remove distracting parts of your photo with standard aspect ratios, or a free crop. Black & White - Get that classic Black and White look with this darkroom-inspired filter. Vintage Films - Make any photo look like a vintage colour film photo from the 50’s, 60’s or 70’s. Drama - Add style with a custom effect specifically tailored to your photos, ranging from subtle textures to wildly artistic effects. Grunge - Give your photos a totally unique, hip, and dingy look. Tilt-Shift - Create a narrow in-focus area designed to simulate depth of field, common in a Miniature Scene look. Details - Enhance details with traditional sharpening or the unique Structure control found in the Nick Software professional products. Centre Focus - Draw attention to the subject of your photo by blurring and adjusting the brightness of the surrounding background. Organic Frames - Add stylized borders to photos for the perfect finishing touch.